This is a cool lil 2 song 7''. Side A ''Face Of Love'' is a lovely old school love song. ''Indiscreet'' is a funky little jam that Grandmater Flash said had the first ever hip-hop break he ever heard on it. 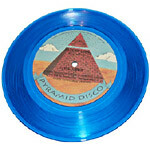 This limited record of 300 comes on clear blue vinyl.